Overview: In 2014, AO tested out a new chat room service called "ArrowChat." It was chosen to give AOers the ability to have group chats and private messaging via a chat window. Think of it as facebook messager, but for AO. We tested it in early 2014 and later implemented for the entire site a few weeks later. AO currently has a license for the software for its lifetime. 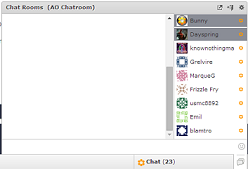 Chat room: Currently, we have one main chat room on AO. You will be automatically logged into it as a default. Private Messaging: If the AO member is logged in, you will be able to select their name from the "Chat" list and left click their name. A private message window will pop open. Applications: We have the "World Map" available for display. It will show all of the locations of where AOers are accessing AO online. More will be added. Bar Links: We only have the "Paypal Calculator" added to the bar links, but more AO related websites will be added in the future. Video Chat: Video chat has been enabled in the chat room as well as private messaging. Mobile Chat: Mobile chat has been enabled. Please use the mobile chat link to use. How to turn off chat room: Go to the bottom of AO and press the "Arrow" button on the bottom right of the page. How to turn off sound: Go to the AO Chatroom by pressing the "Word Bubble" on the bottom right of the page. Go to the "Cog Wheel" at the top left of the pop-out screen. Click on "Chat Room Sounds" to turn off sounds. Make sure there is no check mark on the option. How to turn off private messages: Same steps as above, click on "Block Private Chats." How to connect to mobile chatroom: Go to www.automags.org/forums on your mobile device. Click on "Mobile Chat" on the top bar of AO. On the screen, click "Home" Sign back into Automags.org and click the "Mobile Chat" link once again. It will now authenticate you back to AO and you will be at the Mobile Chat screen that displays "Online Users" and chatrooms available. *You have to log in each time you want to access AO. Arrowchat is aware of the issue. Below are the standard settings for Arrowchat. We changed a few numbers to allow for interaction of AOers to last a longer time. For example, you could hold a private conversation with someone without the risk of their computers locking out. The number has been changed, but this also increases the amount of AOers showing in the "available" chat box. Many people were confused with how Arrowchat actually functions so hopefully this information will make sense of it. There is a pro/con for increasing or decreasing the time. Buddy List Heart Beat: Making this value smaller will use more server resources but ArrowChat will update the buddy list more often. Changed setting to 5. Online Timeout: The time in seconds that a user will be considered offline if inactive for this long. This value cannot be lower than the heart beat. Changed setting to 3600. Idle Timeout: The time in minutes that a user is considered idle after not moving their mouse or pressing a key. An idle user will use less resources. Changed setting to 30. I.E with Chatroom not refreshing: Certain versions of Internet Explorer do not work with the jQuery Arrowchat software. Please make sure you are using an up to date web browser for this function to work. I.E 9, Chrome, and Firefox have been tested and has worked so far. Chat not refreshing There is a variety of reasons why this may be happening. Check to see if refreshing the browser works. Having multiple tabs open with AO could possibly create a conflict with the chatroom. I suggest using the pop-out chat setting to see if that would help. Please comment on this article below and let me know if you are having any issues with the AO chatroom function.